Sir Dayvd's post yesterday got me thinking about a lot of things, including wondering if there have been Hex Signs on Beer Cans (see Beer Can Collecting a few posts ago). The area around Allentown, PA was settled around by 1737 by German immigrants, primarily Mennonites and Lutherans. The first structure on the Allentown site was, appropriately enough, a tavern, and a store opened next door a short time later. Small houses began to spring up around the tavern and the beginnings of Allentown took root. Allentown survived the French & Indian wars, and later sheltered the Liberty Bell while Philadelphia was under English occupation during the American Revolution. With the coming of the railroad in the 1840s, coal from nearby mines became readily available. Blast furnaces, rolling mills, and cement factories followed, and Allentown became a gritty heavy manufacturing town. Frederick Horlacher was born on December 3, 1840 in Wurtemburg, Germany. In 1865 his family emigrated from Germany to Philadelphia. Horlacher attended Pierce Pioneer College and learned to speak English in just six months. He married Carolina Schwartz on January 30, 1868 and the couple eventually had 7 children. 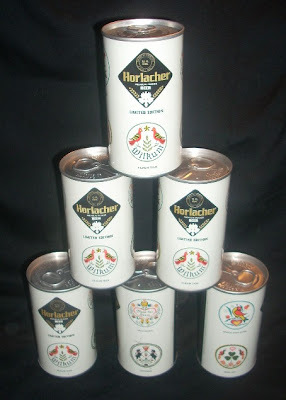 Having tremendous success with the soft drink beverage business, Horlacher took over the brewery formerly operated by J.J. Hottenstein at the northeast corner of 4th and Hamilton Streets in Allentown. In 1886, Horlacher’s son Fred H. joined the growing business. Troubles began for the brewery in WWII when grain was rationed. 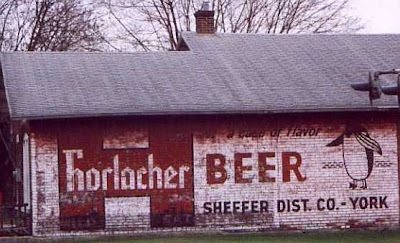 Horlacher had a large market share in New Jersey, so while Neuweiler decided to focus on the Allentown market, Horlacher neglected its home town and tried to ration beer to hold onto its N.J. markets. They felt that it would be easier to regain share in their backyard later than rebuild in New Jersey. 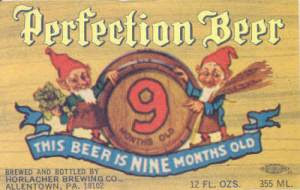 This led to huge bitterness among local taverns and distributors, who could not get beer. The company did everything it could to stay open, but eventually closed for good in 1978. And now you know some of the rest of the Hex / Beer story. nice one. The Bird Hex are more like Fraktur designs, that other PA German artwork i like, than the Geometric Hex. They are both wonderful folk artforms which i enjoy working on. along with the British Roses and Castles Folk art. I have kin in Allentown/Bethlehem and go there every summer for a couple weeks. The history lesson on the town itself was familiar ground for me - the history lesson on the beer was not! Thanks! Oh, Allentown! My first round the bases with a beautiful blonde was in the Smoky Mountains with a girl from Allentown! Teen Age Lust! I still do business there, although not as frequently as in the past. I stay at the Historic Bethlehem Hotel...once the Steel Capital of the World! Never heard of the beer til now. They should have put the Hex's on the bottom of the cans. Still like the coaster idea! Your sign off, my dear Hooky, made me laugh out loud and scare the dog.